Is dry, damaged hair putting a damper on your day? Try using this strengthening hair mask to deep condition those lifeless locks. 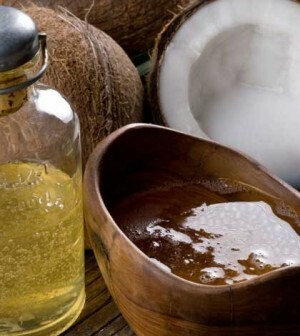 Start by getting some unrefined or refined, though preferably unrefined, coconut oil. Coconut oil has many health benefits. It helps to restore natural oils and moisture and it reduces loss of protein to promote healthy, shiny hair. It is also natural and cost-effective. Take your coconut oil and heat it up in a microwave-safe bowl or on the stove. You don’t want it too hot because you will be applying this to your scalp. Mix the heated coconut oil with one egg. Hair is primarily composed of protein. Protein deficiency can lead to rough, weak strands. By using an egg, protein will be distributed to give your mane a fighting chance. Make sure to have an old t-shirt on or wrap a towel over your shoulders because this can get messy! Begin applying the mixture to your scalp while it’s still warm, being sure to really massage it in. The heat will open up your hair follicles for better absorption into the scalp. Massaging the scalp will also promote hair growth. Be sure to apply this to clean hair. If you have a lot of product build-up, the products will act as a barrier, which will decrease absorption of the strengthening mask. Once you have massaged the mixture throughout your entire scalp, start applying it to your ends and the rest of your hair. Take a plastic bag, like a grocery bag, and wrap your hair in it. Leave this on for 30-40 minutes and then rinse it out in the shower. Try using a sulfate-free shampoo and conditioner because these will be healthier than ones with harsh chemicals. While hair is still damp, you can re-apply a small amount of coconut oil to help retain moisture. Repeat this process 2-3 times per week, depending on the damage of your hair. Be sure not to over-condition either because too much protein can leave your tresses feeling dry and brittle! Thanks for this recipe! I am totally going to use it with my hair…it’s so in need and I have everything I need for it!